What is referred to as Carpal Tunnel injuries is usually a collection of different injuries that are better known as repetitive stress injuries (RSI). They are serious problems that I’ve struggled with to vary degrees for the last 10 years or so. One of the other anarchists has had it longer and had to work through a severe version of it. And I am pretty much the poster child for what happens if you ignore the possibility of RSI. Back when I first started working in software, I worked with a programmer who had to have someone hired to do his typing. The company had people come in and speak about ergonomics and how to avoid RSI. I ignored all of it. Clearly these people were just weak, and I, being invincible, would never suffer such things . Not so much. Age and too many 16 hour days hunched over a keyboard/mouse tend to take their toll. The whole growing older thing is really a pain in the neck (literally). People usually associate RSI with wrists, but in fact it can affect your arms, shoulders, neck, and back. If you’re on a computer a lot (and if you’re reading this most likely you make your living using a computer) it’s critically important that you pay attention to it. It’ll seriously affect your ability to use a computer and, if you’re a photographer, your ability to hold a camera for long periods. So what to do? First thing… start off with ergonomics. 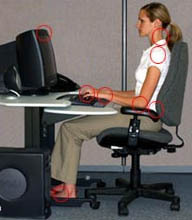 Make sure your keyboard/monitor set up are at the proper height relative to how you sit in your chair. Then… Get a good office chair. A really good one, that’s fully adjustable to your body. Unless you are perfectly average, the average $129 office chair doesn’t cut it. You sit in the thing all day long, every day. Invest $900 into a great chair. It’ll last you years and your body will thank you for it. Personally I have a Steelcase chair which is awesome. If you really are on a budget there are some good cheaper chairs out there. We have a couple from Office Depot that run $250 and are pretty good. The last thing is your input device. Mice are absolutely horrible. Trackpads are worse. We’ve found that trackballs are a better than mice and by far the best thing we’ve tested are Wacom tablets. The tablets are traditionally used for painting on the computer, but if you set them up as a regular input device they put a lot less strain on your wrists, hands, and arm. They do take a bit of getting used to, but they’ve become a critical part of managing RSI for us. They come in a variety of sizes which makes it easier to find one that will work with your setup. You do have to have a keyboard tray/shelf that can accomodate the tablet. For this purpose we’re talking about the Intous or Bamboo tablets. Not the Cintiq monitor/tablets. But we love the tablets, use them in the office and at tradeshows, and can’t recommend them enough as an RSI solution (or at least part of a solution). Anyways, hopefully this article will encourage you to take RSI a bit more seriously and offer up some potential solutions. I definitely welcome comments as to what other readers are using for RSI and what they’ve found helpful. Previous PostGraphics in AsiaNext PostWhy doesn’t Hollywood get it? I couldn’t agree more. Years ago, my right forearm was killing me from using a mouse all day every day. 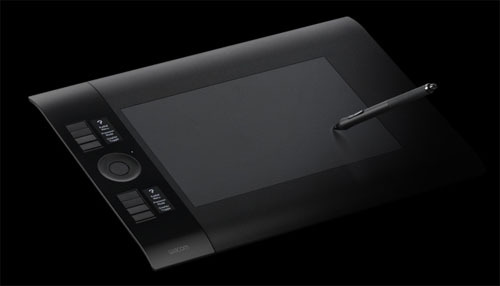 I bought a small Wacom tablet and three days later all the pain was gone, never to return. Thank you Wacom! Do you recommend any specific trackballs? I’ve been thinking about replacing my mouse for a while now. Thanks. Yeah, Wacom is pretty awesome. And they’re super sturdy. The ones we drag around to tradeshows really take a beating and hold up great. We have both Logitech and Kensington ones and there’s not a whole lot of difference between them. Both work well.